I have heard of detoxing but never really got a chance to try it out. I do juicing as part of my healthy diet and exercise routine but this was a different experience. After a 7 long days of Fashion Pakistan Week and work craziness which literally gave me no time for Zumba this detox challenge was just what I needed to jump start my system. Juicing simply involves a process where the natural liquids, vitamins, and minerals are extracted from different raw plants, vegetables and fruits to make varying concoctions with health benefits. Its a fast developing fitness trend loved by many. 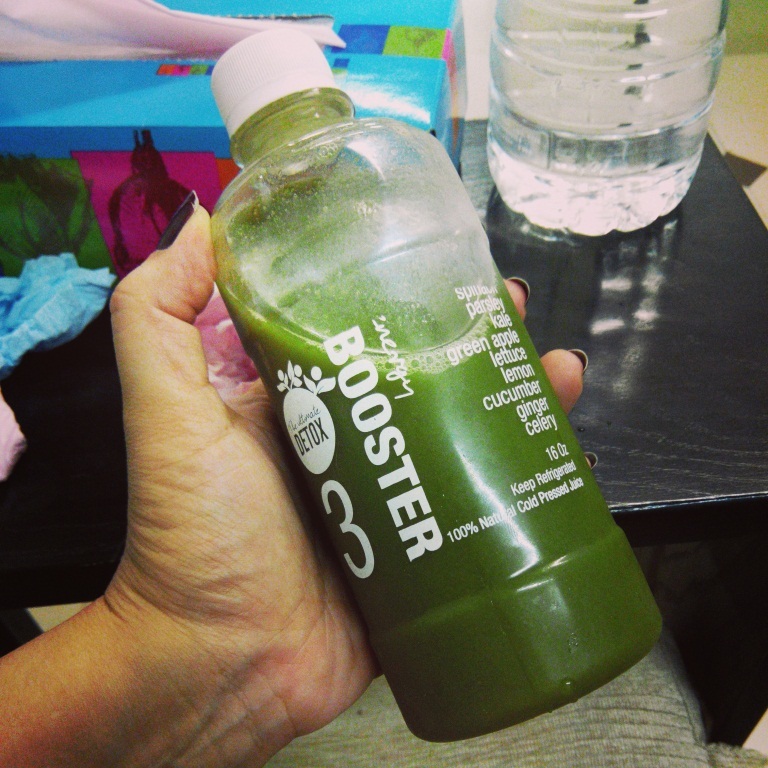 Juicing can be done through different ways, the most favored is cold pressed. You can get some delicious Juicing recipes online as well. Your Body needs to be taken care off, not only from the outside but from the inside as well. The drinks are loaded with the vitamins, minerals, antioxidants, anti-inflammatory compounds, and phytonutrients all in one easy to sip liquids. WHAT is the ULTIMATE DETOX? 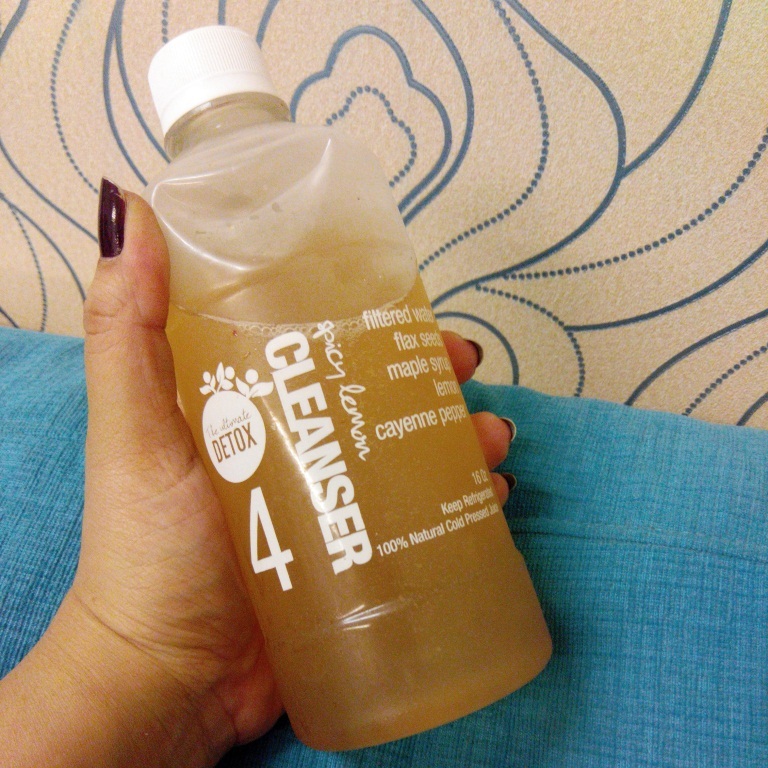 The Ultimate detox that I tried and tested is created by Yogi Salina Taqi of Salina Cosmetics in collaboration with StudioX. 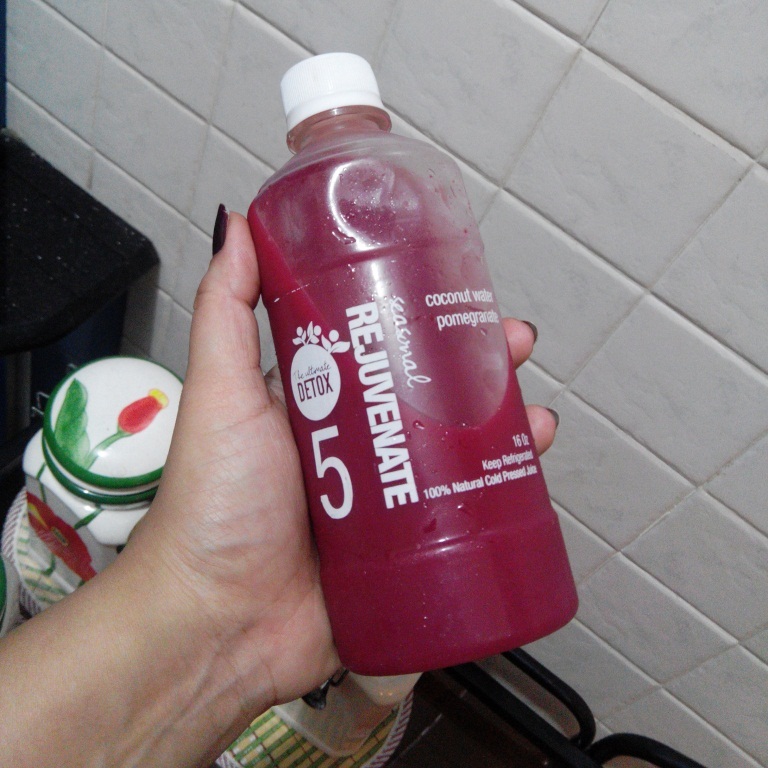 The Detox consists of 7 bottled juice mixes which one consumes in an entire day with intervals of approx 2 hours in between. 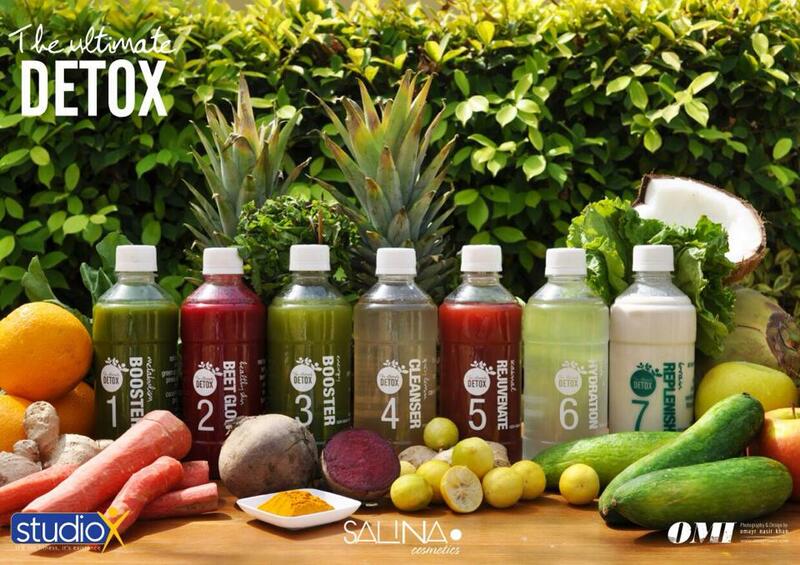 Each bottle contain 16 full oz of detox juice/liquid. Detoxing routine depends on the person and what your goals are. If you are looking to loose weight and shrink your appetite then once a week detox is recommended. If you are looking to just cleanse your system then a 7 day cleanse, every spring and fall is good. This is NOT a diet, its a lifestyle choice and cleansing routine. Please let me clarify this is not an alternate to diet rather a preparation for a better, healthier lifestyle through a balanced fitness routine. 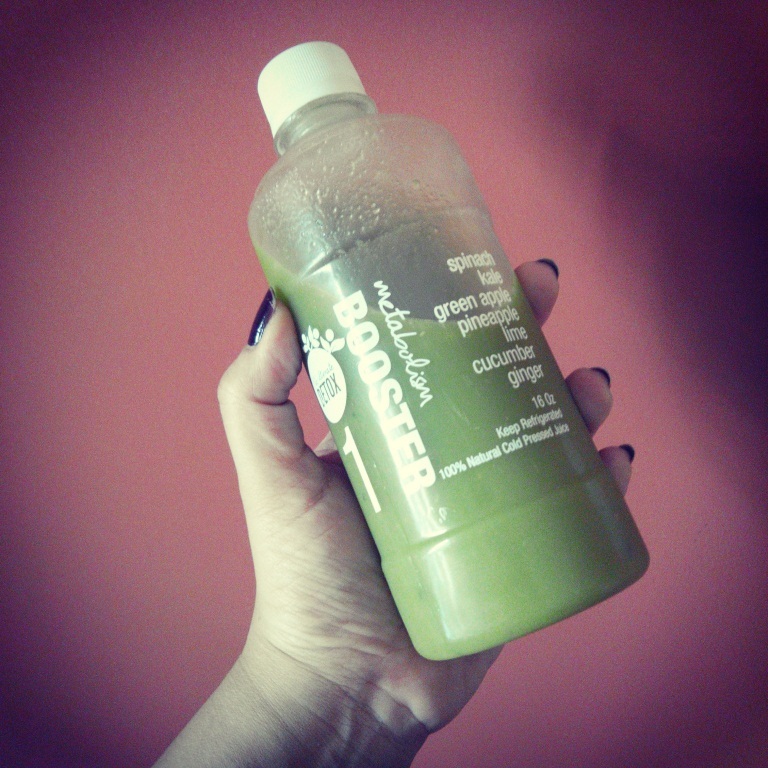 The Detoxing Challenge began with this refreshing chilled juice first thing in the morning. The strong taste was mostly of apple with a hint of spinach and a slightly bitter-sour, but bearable, after taste of lime. 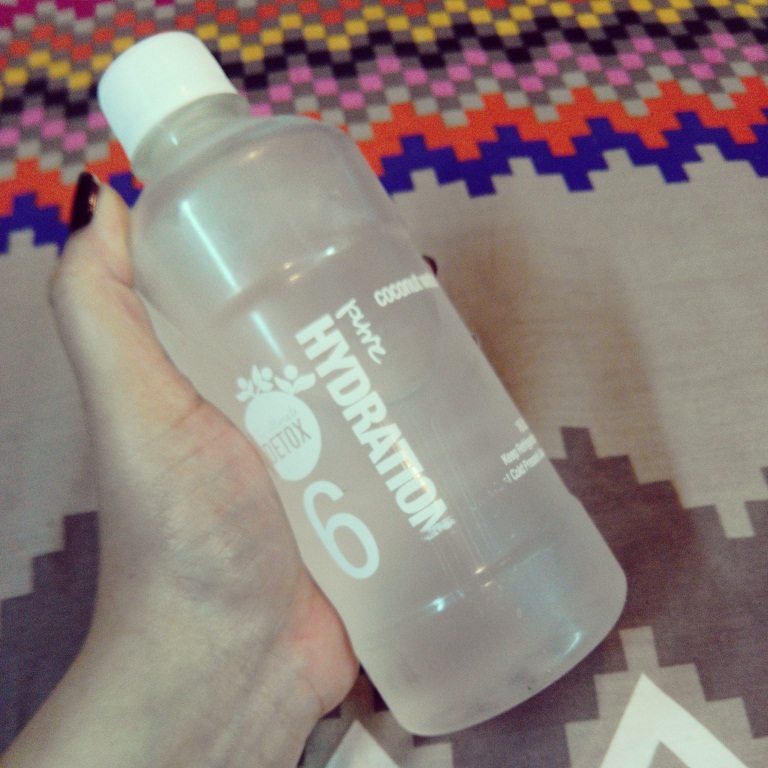 This was one of my favorite concoctions of the 7 bottles. Really delicious and best served chilled. 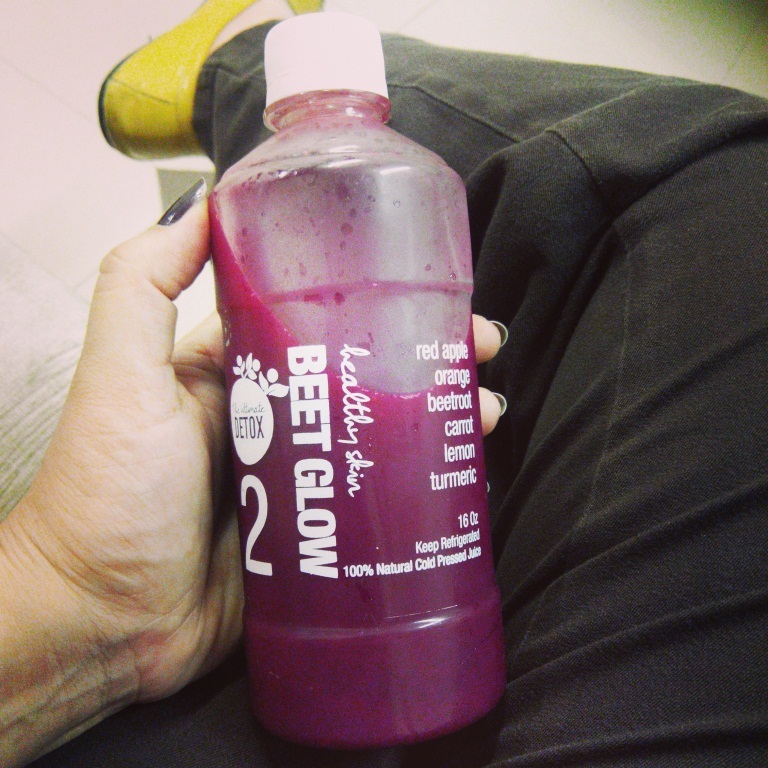 Beetroot never tasted so yummy! This cannot go wrong. how can you when you have power flavors like coconut and pomegranate. Serious yum moment! This is a tough challenge for most as it requires ONLY drinking these particular blends all day along with hydrating yourself with water. Other than that NOTHING ELSE. Noo food, no tea or coffee, no drinks etc, only DETOX. Prepare yourself a couple of days earlier to make sure you go through the Detox smoothly. When a detox is done right, it’s just another word to describe a diet rich in whole foods. By removing artificial flavors and chemical substances from your diet, you’re helping prepare your body to live a healthier and more natural lifestyle. P.s: I found the packaging simple yet very creative with all the required information. 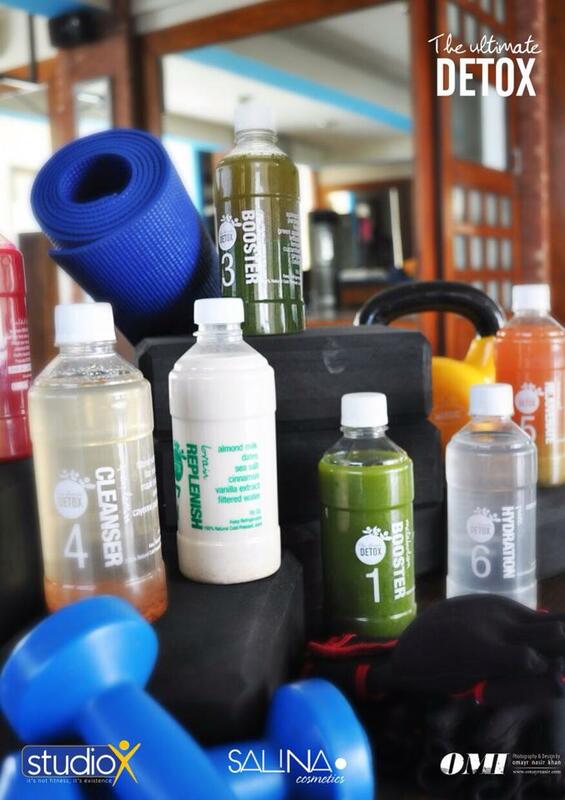 At the moment these delicious beauties are available at STUDIOX in Defence, Karachi for PKR.3500 for a set of 7 bottles (a day of detox). Many may argue that they can make these juices at home so why buy them? Well, for the crazy professionals always on the go while trying to take care of themselves and acquire a healthier lifestyle these ULTIMATE DETOX Juices are a blessing.